Chunky sterling silver wheat necklace, width 9mm. This is a dramatic substantial wheat necklace made in Italy. 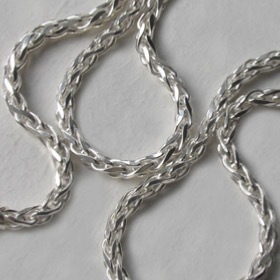 The silver is silky smooth and the links glide together in this wonderful classy style. The necklace has a round nautical style fastener which can be worn to be seen or hidden at the back of the neck. Check out our entire sterling silver chains collection!